Power Line is an American political blog, founded in May 2002. Its posts were originally written by three lawyers who attended Dartmouth College together: John H. Hinderaker, Scott W. Johnson, and Paul Mirengoff. The site is published by Publir, founded by Joseph Malchow, also a Dartmouth graduate. The site gained recognition among the American right for its role in covering the Killian documents story that aired during the 2004 Presidential campaign about forged documents relating to President George W. Bush’s term of service in the Texas Air National Guard, which kept him out of the Vietnam war. In 2004, Power Line was named Time magazine‘s first-ever “Blog of the Year.”[ When AOL added blogs to their news website in 2007, Power Line was one of the five blogs included. A 2007 memo from the National Republican Senatorial Committee described Power Line as one of the five best-read national conservative blogs. The major writers for Power Line Blog are Steven F. Hayward, John H. Hinderaker, Scott W. Johnson, and Paul Mirengoff. Susan Vass, writing under the name “Ammo Grrrll,” contributes a humor column to the site each Friday. John Hinderaker lives in Minnesota and has written extensively about the new Congresswomen from Minnesota. 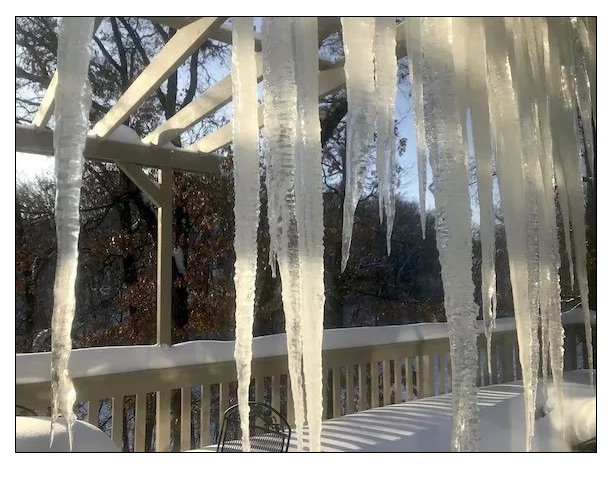 Yesterday John Hinderaker posted an article about the current weather in Minnesota. I wrote here about the epic winter we are having in Minnesota, hard on the heels of “expert” testimony in Minnesota’s legislature to the effect that we don’t get much snow anymore because of global warming–false, snowfall has been increasing, not decreasing–and temperatures in Duluth are no longer expected to dip below 10 degrees. Less than two weeks after that testimony was given, the winter turned brutal and the temperature in Duluth fell to 25 below zero. The Al Gore Effect lives! Memo to the alarmists who warned us that children will grow up, no longer experiencing snow: not to worry. 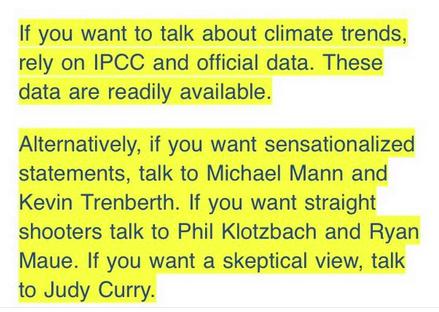 Of course, all of this is just “weather,” as the alarmists tell us. But climate is experienced as weather, and the alarmists have made countless predictions about weather, pretty much all of which have turned out to be false. A model that generates false predictions has the same value as a losing lottery ticket. So I guess we should be happy that a blizzard is on the way. I guess the people in Minnesota would welcome global warming. Steven Hayward posted an article at Power Line yesterday about some recent research on deforestation. It seems that it is not happening. I have noted from time to time the data from the United Nations Global Forest Resource Assessment (UNGFRA) that has found that deforestation stopped at least 25 years ago, and that net reforestation has been taking place. But the UN data is not as good as one would like. This week, however, Naturemagazine published a major new studywith much more precise measurements and analysis than the UNGFRA based on 35 years’ worth of satellite imagery, and it finds that since 1982 global forest cover has increasedby 7.2 percent, or 2.24 million kilometers. Changes in land use and land cover considerably alter the Earth’s energy balance and biogeochemical cycles, which contributes to climate change and—in turn—affects land surface properties and the provision of ecosystem services. However, quantification of global land change is lacking. Here we analyse 35 years’ worth of satellite data and provide a comprehensive record of global land-change dynamics during the period 1982–2016. We show that—contrary to the prevailing view that forest area has declined globally—tree cover has increased by 2.24 million km2 (+7.1% relative to the 1982 level). This overall net gain is the result of a net loss in the tropics being outweighed by a net gain in the extratropics. Global bare ground cover has decreased by 1.16 million km2 (−3.1%), most notably in agricultural regions in Asia. Of all land changes, 60% are associated with direct human activities and 40% with indirect drivers such as climate change. Land-use change exhibits regional dominance, including tropical deforestation and agricultural expansion, temperate reforestation or afforestation, cropland intensification and urbanization. Consistently across all climate domains, montane systems have gained tree cover and many arid and semi-arid ecosystems have lost vegetation cover. The mapped land changes and the driver attributions reflect a human-dominated Earth system. In addition to the reforestation of the earth, global warming has slowed down since 1999. I guess those who study the earth and its climate have not yet figured out all of the answers. WattsUpWithThat posted an article today about temperature records set during the past two years. The records were not what was expected. This is not to say that we shouldn’t do what we can to limit air pollution, protect clean water, and keep our planet clean. We need to do that because we are responsible human beings. However, we don’t have to run around with our hair on fire about something we can’t change. 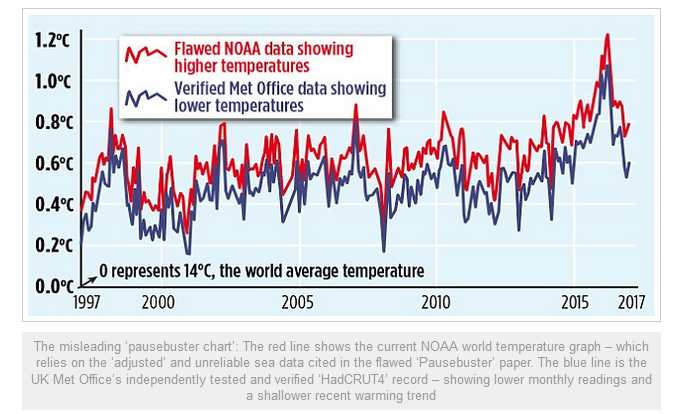 NOAA (National Oceanic and Atmospheric Administration) has made repeated “adjustments” to its data, for the presumed scientific reason of making the data sets more accurate. …By the way, a similar result occurred after the brutally cold 2013-2014 winter in New York. It was simply adjusted away. Do this year after year, and with the goal of radically altering the temperature record to fit the global warming narrative, and you have what amounts to climate fraud. Who would have thought that research into climate science has reached the point where it is simply about money. Investor’s Business Daily posted an article yesterday about the Paris Climate Accord. It seems as if President Trump did the right thing by pulling America out of the agreement. There is still no agreement among scientists as to the role that man and his civilization play in climate change. Obviously the climate has been changing continually since man has inhabited the earth. There is a documented period of global warming during the Middle Ages, and there is no way that carbon emissions could be responsible for that. There are also plant fossils found beneath the ice in Greenland, another indication that the climate has changed over time. We all remember the TIME Magazine cover during the 1970’s warning of the coming ice age. We also know that our local weatherman is not accurate 100 percent of the time. What the report does make clear, however, is that all the posturing by government leaders in Paris was just that. Posturing. None of these countries intended to take the drastic and economically catastrophic steps environmentalist claim are needed to prevent a climate change doomsday. As such, Trump was right to stop pretending. Whether you believe in climate change or not, the Paris climate accord amounted to nothing, or pretty close to it. Even the UN admits that now. We need to look at the balance between civilization of the environment. America is one of the economic leaders in the world and yet one of the least polluting. Look at the progress we have made in recent years–many of our formerly polluted rivers are being cleaned up, the industries that created the ‘super fund sites’ are now controlled to the degree that they can no longer ruin the environment, waste disposal has improved, and carbon emissions for cars and factories have decreased. We are making progress. The Paris Agreement would not have positively impacted that progress–it would only have crippled the American economy. 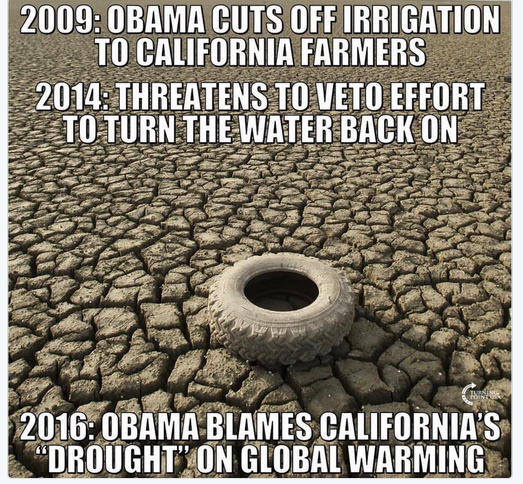 Global warming is one of the sacred cows of the political left. Part of this is due to the fact that climate change can be used as a weapon against capitalism, free markets, and successful democratic nations. So that explains why the political left is so in love with the idea of global warming. Now let’s look at the omissions in a recent Associated Press article about global warming as reported in The Daily Caller. 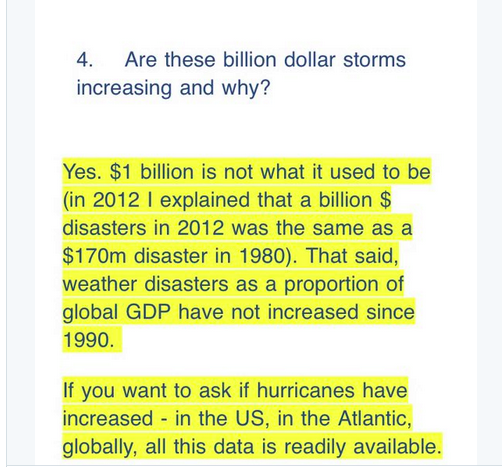 An Associated Press reporter sent some questions to Dr. Roger Pielke Jr. about what role global warming played in this year’s slew of billion-dollar natural disasters. Pielke, an expert on natural disaster costs, apparently didn’t give AP reporter Seth Borenstein the answers he was looking for, because his ensuing article didn’t have any quotes from the University of Colorado professor. Please follow the link to The Daily Caller and read the entire article. It illustrates how the media tries to shape the debate rather than simply reporting facts. As I have stated before, the best website on the internet for climate information is wattsupwiththat.com. On Friday, The Heritage Foundation posted an article about what wasn’t the cause of Hurricanes Harvey and Irma. The hurricanes were not the result of global warming. …Man-made warming did not cause Harvey and Irma. As carbon dioxide and other greenhouse gas emissions have increased, there have been no trends in global tropical cycle landfalls. Before Harvey and Irma, with a little bit of luck, the United States was in a 12-year hurricane drought. More importantly, the average number of hurricanes per decade reaching landfall in the U.S. has fallen over the past 160 years. Other media outlets took a more measured approach, claiming that man did not cause Harvey and Irma but supercharged them. The reasoning is that warmer sea surface temperatures increase moisture in the air and, in turn, up the intensity of the hurricanes. 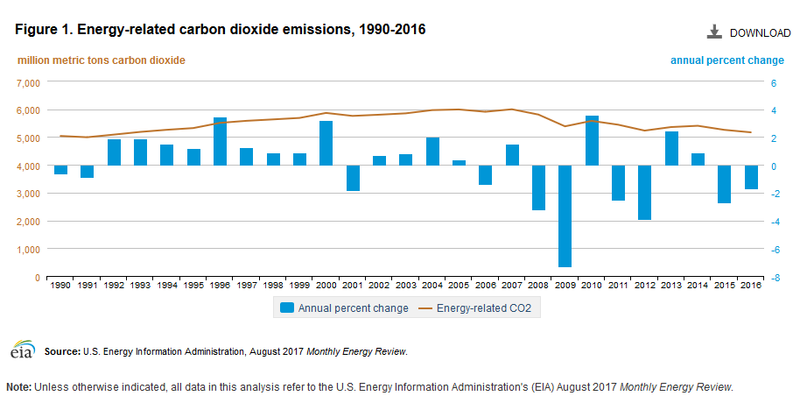 Even if man-made warming were responsible for Harvey and Irma, the policies that tax or regulate carbon dioxide and other greenhouse gas emissions are costly non-solutions. 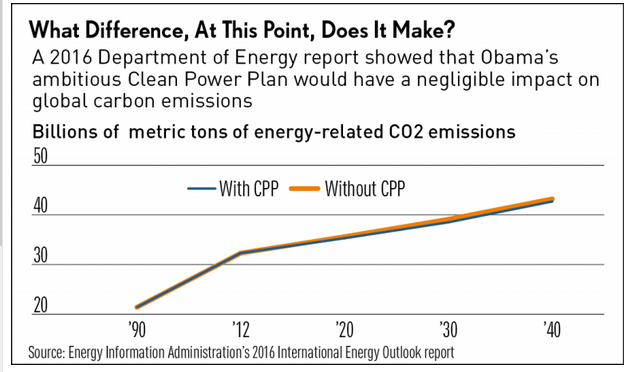 The U.S. could slap a $40 tax on all carbon dioxide emissions, and the “climate benefits” would be hardly noticeable. By the year 2100, the averted warming would be less than two-tenths of a degree Celsius, and the averted sea level rise would be less than 2 centimeters. Political opportunism is distracting from what is important: helping the people in Houston, Florida and the islands. Policymakers should focus on improving natural disaster response, resilience and preparedness. Blaming man-made climate change on Harvey and Irma is truly denying the data. Let’s keep our priorities straight! Yesterday The Independent Journal Review posted an article about the global warming predictions that were supposed to be happening about now that are nowhere in sight. The cult’s leader — Al Gore — said in 2009 that there was a 75 percent chance that the entire arctic polar ice cap would melt by 2014. The year before the North Pole was supposed to be gone, noted climate scientist Hans von Storch went against cult orthodoxy in an interview with Spiegel Online in 2013 and had some interesting things to say about the climate prediction models so revered by the alarmists. I’m not a scientist, but it seems to me that if your predictions supposedly using the scientific method continually do not happen, there might be something wrong with your models or your calculations. Climate alarmist James Hansen’s prediction of Manhattan being underwater by 2018 seems to not be happening, so he’s moving his own goal posts and saying “50 to 150 years” now. That’s the beauty of being one of the “we believe in science” people: there’s never any penalty for being wrong. Every prediction that doesn’t come true isn’t a cause for reflection about perhaps adjusting the conclusion; it’s merely an opportunity to pull a new prediction out of thin air. Perhaps they are finally getting embarrassed, though. Tossing all of the predictions a century down the road at least saves them from having to be around when those are proved wrong. The global warming movement has never been about science or the environment. The earth’s climate is cyclical. Scientists have found fossils in Greenland of animals from much more temperate climates. The Middle Ages experienced a period of global warming that had nothing to do with SUV’s. The bottom line is that man is rather insignificant in the grand scheme of the earth’s climate. I believe that we have a responsibility to keep the earth as clean as possible, but we also have a responsibility to develop the earth’s resources to allow all people on the planet to experience freedom and the ability to earn enough to have food and shelter. Redistribution of wealth is not the solution to poverty–freedom is–and that is exactly what the global warming crowd is trying to limit. I would like to note at this point that at least one generation of school children has been raised on this fake science as if it were fact. Combined with the fact that our children are no longer being taught critical thinking skills, this may be a major problem for the future of our country. This is the link that will show you the places where those people who want to convince you that the earth is getting warmer have placed their temperature measuring devices. I am not a scientist by any means, but I question the wisdom of measuring temperature right next to the air conditioning vent of a large building. There is also a sensor placed within ten feet or aircraft (which I assume are occasionally started up and moved). Follow the link and enjoy the show. Wattsupwiththat posted an article today about some recent climate news. Global warming is simply not living up to the expectations of the computer predictions. Meanwhile, the climate is always changing. The earth’s climate has been changing since before man got here. The question is how much does the activity of man impact the climate. That is the answer we don’t have. It is always a good idea to clean up the air and water as much as possible. However, it is also a good idea to do anything possible to raise the standard of living in places where industrialization and modern sanitation has not yet taken hold. The idea behind the global warming panic was to shake down industrialized countries to give money to third-world countries run by tyrants. Very little of that money would go toward anything related to climate change and very little of that money would be used to alleviate poverty where it was sent. Now that the scientists have admitted that they don’t know why there is a hiatus in global warming, maybe we can all relax a little and go on with our lives. John Hinderaker at Power Line Blog posted an article today about the cancelled 2017 Arctic expedition of the University of Manitoba. So too much ice is the result of climate change? I thought we were concerned about global warming. Generally speaking, global warming does not result in more ice. Someone needs to explain to these scientists that the climate has been changing constantly (and cyclically) since earth began. I refuse to believe climate predictions from people who have been consistently wrong for more than forty years. Does anyone remember ‘the coming ice age‘ headlines of the seventies? Freedom Of Speech In The Classroom? Yesterday The Daily Caller posted an article about freedom of speech in American classrooms. There is a group of Democratic Representatives that have decided that it is time to destroy books that disagree with what they believe. Three senior House Democrats asked U.S. teachers Monday to destroy a book written by climate scientists challenging the environmentalist view of global warming. 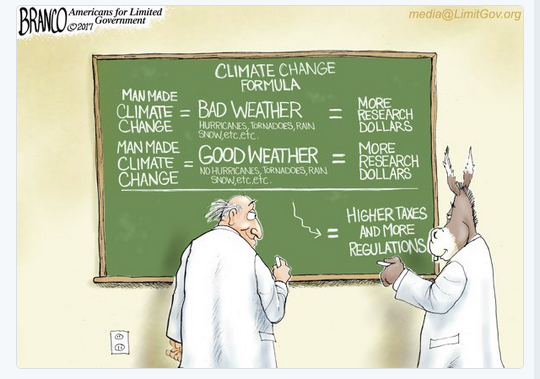 The Democrats were responding to a campaign by the conservative Heartland Institute copies of the 2015 book, “Why Climate Scientists Disagree About Global Warming” to about 200,000 science teachers. Democratic Reps. Bobby Scott of the Committee on Education, Raúl M. Grijalva of the Committee on Natural Resources, and Eddie Bernice Johnson of the Committee on Science, Space and Technology all issued a statement telling teachers to trash the book. The book’s three authors all hold doctorates and taught climate or related science at the university level. The book was written by former Arizona State University climatologist Dr. Craig D. Idso, James Cook University marine geology and paleontology professor Robert M. Carter, and University of Virginia environmental scientist Dr. Fred Singer. I would like to know the basis for the Democrat Representatives’ declaration that the authors of this book are anti-science. The authors look pretty well educated in their fields. What is the scientific background of the Representatives? Please follow the link above to read the entire article. It is truly amazing. Eventually Representative Raúl M. Grijalva of the Committee on Natural Resources decides that the problem of not having agreement on global warming can be placed at the feet of the Koch brothers. I guess everyone needs a target to blame. On Saturday (updated Sunday), The U.K. Daily Mail posted an article about new evidence of misconduct by those who are attempting to sell the idea of global warming. …But the whistleblower, Dr John Bates, a top NOAA scientist with an impeccable reputation, has shown The Mail on Sunday irrefutable evidence that the paper was based on misleading, ‘unverified’ data. I am not a scientist, but I recognize a scam when I see one. I hate to be cynical about this, but it seems as if the expression ‘follow the money’ applies here. One of the power blocs in the United Nations is the Organization of Islamic Cooperation (OIC). Despite the fact that many of the 57 nations in this group are very wealthy due to oil money, many of the people in these countries live in extreme poverty. The OIC looks at the prosperity of western countries and wants their money. They already get a lot of our money because they have oil, but greed is greed. Redistribution of wealth will leave wealthy democracies poorer and enrich dictatorships that are currently poor. This is the concept the global warming alarmists want to eliminate. We need to make sure that they are not successful. WattsUpWithThat posted an article this week about a recent study, published in the European Geosciences Union journal The Cryosphere..
Jonathan Day, who led the study, said: “The missions of Scott and Shackleton are remembered in history as heroic failures, yet the data collected by these and other explorers could profoundly change the way we view the ebb and flow of Antarctic sea ice. “We know that sea ice in the Antarctic has increased slightly over the past 30 years, since satellite observations began. Scientists have been grappling to understand this trend in the context of global warming, but these new findings suggest it may not be anything new. There are a few things to learn from this. First of all, we are not as smart as we think we are and really have no idea what man’s impact on climate is or if man has any impact on climate. Second of all, the global warming industry is about money and control–it really has little to do with global warming. Do you really believe that if the people claiming that global warming was going to kill us all tomorrow believed that global warming was catastrophic, they would be traveling to their global warming meetings in private jets and living in houses with carbon footprints bigger than that of a small nation? If you need proof that global warming is hype related to money and control, please read this story. It illustrates one way that Congressmen come to Washington as middle-class citizens and leave as millionaires. The story is a beautiful example of one time the plan to gain instant wealth through legislation didn’t work! The Daily Caller posted a story about climate research at the global warming research center at the London School of Economics. Meanwhile, the CCCEP was attempting to get another $5.4 million from the government to pay for operations until 2018. Now think about that for a minute. If the results of the study were predetermined, why did they do the study? Also, what does that tell us about the scientific aspect of the studies on climate control–are those results predetermined also? Even with my limited knowledge of the Scientific Method, I know there is something wrong with reaching the conclusion before you do the research (or without doing the research). In case you are a new reader of this blog, I would like to recommend wattsupwiththat.com as the best, most honest website on the Internet dealing with climate change. On June 30th, The Providence Journal posted an article about the United Nations concerns for the heath of the world if people continue to eat meat. It may be delicious, but the evidence is accumulating that meat, particularly red meat, is just a disaster for the environment – and not so great for human beings, too. By 2050, scientists forecast that emissions from agriculture alone will account for how much carbon dioxide the world can use to avoid catastrophic global warming. It already accounts for one-third of emissions today – and half of that comes from livestock. That’s a driving reason why members of a United Nations panel last month urged its environmental assembly to consider recommending a tax on meat producers and sellers. By raising the cost of buying meat, it would ultimately aim to reduce production and demand for it. Maarten Hajer, professor at the Netherlands’ Utrecht University, led the environment and food report that recommended the meat tax. First of all, I would like to point out that human beings have canine teeth–they are designed for eating meat. Second of all, I would like to point out that man-caused global warming is a myth. For honest information on global warming see wattsupwiththat. The United Nations has forgotten its purpose. The United Nations supposedly originally started to avoid world wars by creating a place for negotiation and dialogue and to encourage the expansion of individual freedom in all countries. However, in recent years, the United Nations has become an organization desiring to form a one-world government and take away individual freedom. Agenda 21 is a prime example of this. If you are unfamiliar with Agenda 21, google it or use the search engine on this website. The United Nations wants to control where you live, how big your house is, how much property you own, and now, how you eat. But, governments must soon move to limit major carbon producers, Hajer said. Food companies will naturally be part of that. The idea of a meat tax has developed over the past 25 years as a “completely obvious” measure to economists and environmentalists, Hajer said, as knowledge of the environmental toll of meat emerged. Agriculture consumes 80 percent of water in the United States. For a kilogram of red meat, you need considerably more water than for plant products. Governments are starting to take notice. China, which consumes half of the world’s pork and more than a quarter of its overall meat, announced new dietary guidelines last week that advise the average citizen to reduce meat consumption by half. That country’s meat consumption has increased nearly five-fold since 1982, even though their population has only increased by 30 percent during that time. Denmark went a little further in May. The Danish government is considering a recommendation from its ethics council that all red meats should be taxed. Red meat accounts for 10 percent of all greenhouse gas emissions, and the council argued that Danes were “ethically obliged” to reduce their consumption.